HISTORY: The beginnings of the cornet evolved from the French post horn. It was wound into a single coil and fitted with two valves by instrument maker Halary of Paris around the year 1825. This instrument was named the valve cornet. The final form was called cornet d’harmonie, and then the name was changed to cornet a pistons. In the early years of the instrument in Germany the name was Posthorn mi Ventil. The valved instrument in England was known as the cornopean, cornet, stop horn, or a small stop horn. Halary referred to the new instrument as cornet d’harmonie, and he marked with crooks for C, B, A flat, and G. The cornet has always been a part of musical ensembles in the United States. In the first part of the 1900's, the cornet was the solo instrument of choice with many cornet virtuosos performing all across the country as well as the capitols of Europe. In the mid-1900's, the instrument was all but replaced by the trumpet. Much of the concert band music over the years was composed with the cornet in mind, but today, most ensembles use the cornet and trumpet interchangeably and most virtuoso work is performed on the trumpet. Today, the cornet is used primarily in the British Brass Band style of music where the cornet is a unique section in the ensemble. PHYSICAL DESCRIPTION: A brass instrument with valves related to the trumpet but lacking the brilliance of a trumpet. The cornet has a wider bore and a deeper mouthpiece than a trumpet does, thus giving it a more mellow sound; also, the cornet has a conical bore as opposed to the trumpet's cylindrical bore. SOUND PROPERTIES: Sound is produced in a similar manner to other brass instruments (trumpet, trombone, tuba, etc.). The performer’s lips vibrate against the mouthpiece producing sound. As with the alphorn the cornet has a conical bore in opposition to the trumpet's cylindrical bore. This causes the cornet’s tone to have more of a mellow sound. 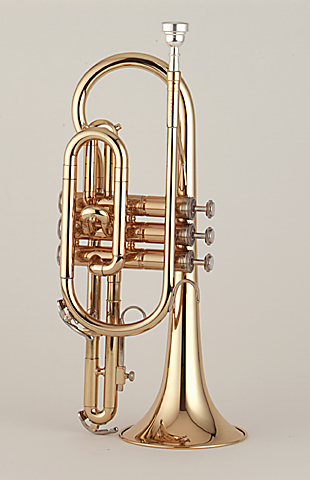 RANGE: The cornet is pitched in B flat, and has a practical range from F sharp3 to C6. Professionals often extend the range, attaining notes more than an octave higher.